A great drawing Debra, I know what you mean about faces. I'm much more comfortable drawing objects and landscapes, that's why I chose my faces theme...just to make me try harder! Thats a challenging angle, the way he's holding his head! 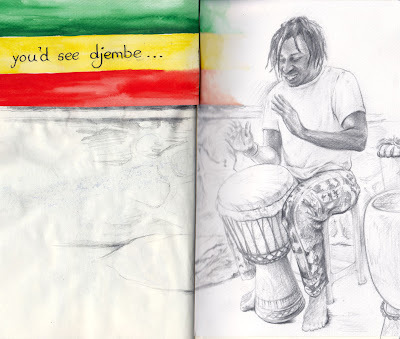 I think you did a lovely job on this - it really captures his enjoyment in playing the djembe. Djembe looks like a lovely man, how lucky you are to have all these things where you live. Its lovely getting near the end of this project, I have so many ideas for what to do next. I know what you mean about people's faces - a single line can change all, but your work is above this. Your lovely capture of the joy and the creases on the jeans are excellent. I think you have done a great job; you have captured his enjoyment, the movement, and the portrait looks good too. Good luck with finishing the sketchbook, you are almost there!